The information presented on this page was originally released on February 10, 2005. It may not be outdated, but please search our site for more current information. If you plan to quote or reference this information in a publication, please check with the Extension specialist or author before proceeding. I was at an office complex last week when I noticed the Mahonias right outside the door were just beginning to open up their sprays of yellow blossoms. It's like a signal, groundhog or no, that spring is around the corner. From my perspective, the Mahonia deserves a place in the landscape similar to a piece of statuary: as an accent near the front door or just off the patio. I also have seen very nice mass plantings. The Mahonia is in the barberry family and has distinctive evergreen foliage that changes colors throughout the year. This plant seems to always be attractive and command attention. Mahonias are not all that hard to find at garden centers, and now is a good time to begin shopping. It could make an excellent Valentine's Day gift for that special loved one. The happiest Mahonias in the South receive only filtered light during the hottest times of the day. The Mahonia looks best as part of a shrub bed. You will be most unhappy growing the Mahonia mixed with turf. Prepare your soil by incorporating 3 to 4 inches of organic matter and 2 pounds of a 5-10-5 fertilizer per 100 square feet of planting area. Till the soil 8 to 10 inches deep. Dig the planting hole three to five times as wide as the rootball, but no deeper. Place the plant in the hole and backfill with soil to two-thirds the depth. Tamp the soil and water to settle, add the remaining backfill, repeat the process and apply mulch. Moisture is critical the first year, so water deeply when required. Feed established plantings in March with a slow-release, balanced fertilizer like an 8-8-8 at the rate of 1 pound per 100 square feet. The Mahonia is not considered a high-maintenance plant. It is related to the nandina and the barberry and has the same cultural habits. Prune out about one-third of the old woody canes to encourage new, young shoots. The bright yellow, fragrant blossoms and busy bees give a breath of spring this time of year. The blossoms will give way to steel-blue fruits that are formed in huge, grape-like clusters and command attention from us, as well as the birds that devour them. Everyone needs at least one. We grow two basic types, or species, of Mahonias in the South. 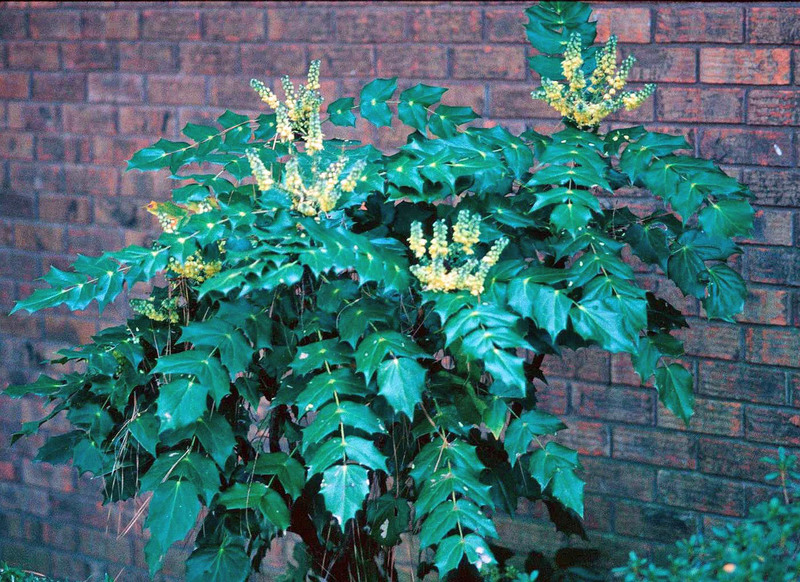 The Mahonia aquifolium, also called Oregon Holly Grape, reaches 3 to 5 feet in height. The new, holly-like growth has a bronze-to-red coloring that turns to deep, glossy green. The leaves are purple-red in the fall. This plant is sold generically, but there are varieties like Golden Abundance, King's Ransom and Flame that have gained attention. The other species is Mahonia bealei, or Leatherleaf Mahonia. There are more southern suppliers of the Leatherleaf Mahonia than the Oregon Holly Grape. It is the taller of the two, reaching 4 to 6 feet in height, but occasionally coming close to 10 feet. The mature width will be 4 to 5 feet. These two Mahonias are strikingly exotic in the landscape and showy at a time when not much else is happening. Take a survey of your landscape to see where Mahonias might add enjoyment with their beauty.